Farhan Akhtar probably is the only all-rounder the silver screen has today. He is a multi-talented Bollywood personality and has enchanted cine lovers with his acting, direction, singing and poetic skills. The versatile actor-director is gifted with an appealing voice and is passionate about singing. He continues to rock the Live music circuit arena both in India and worldwide. His band ‘Farhan Live’ is one of India’s top live rock bands and comprises of talented singers and musicians as Shannon Donald, Sarosh Izedyar, Darshan Doshi, Dibyajyoti Nath & Umang Doshi. Become part of a delightful evening as Farhan & his band members sing and perform Live on Bollywood hits. 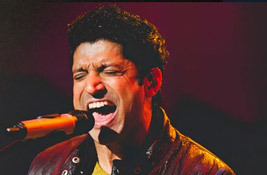 Farhan Akhtar will be performing for the first time in Sydney along with his band. 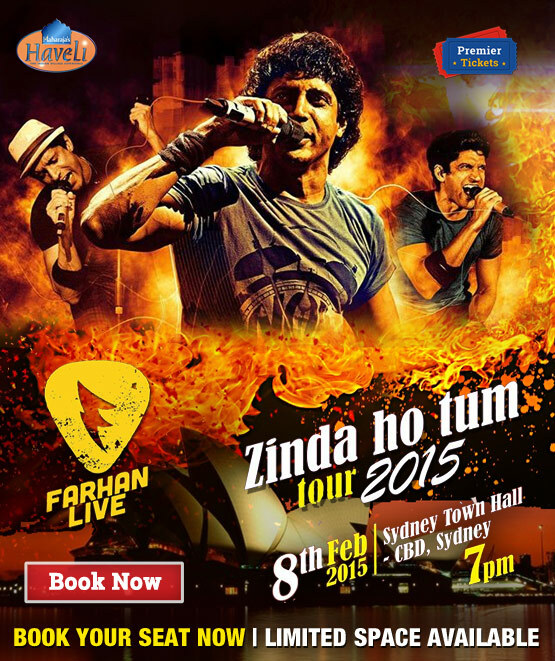 Be a part of the magical evening on February 8th as Farhan rocks the stage at Sydney’s prestigious Town Hall Live! Farhan will sing and perform on famous Bollywood numbers from both the movies he has directed, acted and ones he has lend his magical voice to. Farhan will entertain audience while he and his band members sing and play Rock On, Senorita, Dil Chahta Hai, Socha Hai, Zinda, Hawan Karenge and more! Grab the best seats before they are gone! Contact Premier Tickets or Call 1300 653 488 to reserve your seat for the event. 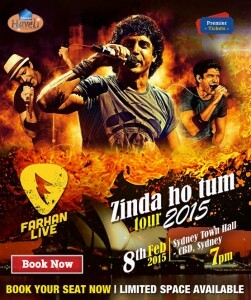 Here’s a selection of some of the hits Farhan and his band will perform LIVE IN SYDNEY! The Farhan Live – Zinda Ho Tum event is being organized by Rock On Entertainment – an enthusiastic event management company. Rock On Entertainment specialises in setting, managing and marketing Bollywood’s premium musical events for the South Asian audience in Australia & New Zealand. It has a team of young and vibrant professionals who are passionate about Entertainment and Bollywood. The team exudes tremendous energy that is evident in every show they put up. Rest assured with Rock On Entertainment taking full charge of your upcoming show. Witness highly professional planning, organisation and management resulting in a successful event. 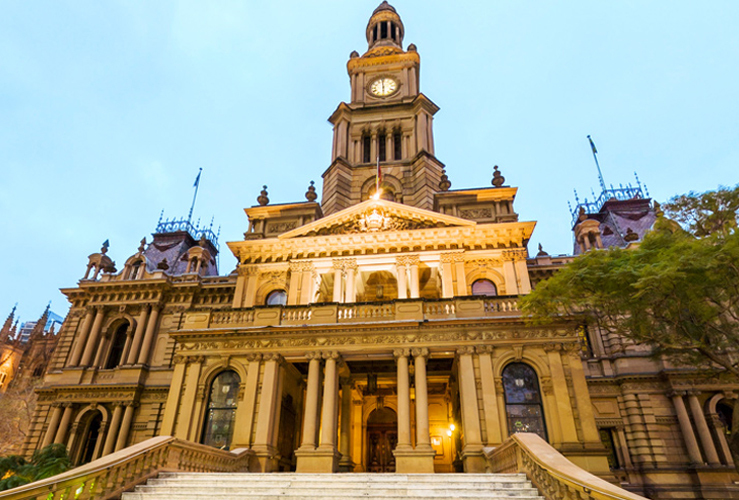 The Sydney Town Hall is one of the grandest surviving and most loved buildings in Australia. The historical building has acted as an iconic setting for major Australian civic, community & cultural celebrations.The grand architecture is a delicate mix of neo-Classical & French elements and combines state-of-the-art venue facilities along with spectacular interiors. Premier Tickets is proud to be associated with Maharaja’s Haveli, our host for the Farhan Akhtar Meet & Greet event and our sponsor for the Farhan Live – Zinda Ho Tum. Maharaja’s Haveli is a popular restaurant offering Indian flavour and delicacies to food lovers in Sydney amidst a cheerful and stylish atmosphere. Located at Quaker’s Hill Sydney the eatery offers its visitors a regal dining experience. For more details on Maharaja’s Haveli, Click Here. For any queries related to the changes in the schedule of the event or cancellation of tickets, customers are requested to contact the event organiser, Rock On Entertainment directly. Q.1. Can I choose a specific seat? Yes. Premier Tickets Australia allows you to choose your desired seat when you buy tickets online from our website www.premiertickets.com.au. You can get an idea about the location of the seat category in relation to the stage and choose accordingly. Q.2. Is there any separate booking fee or Credit card transaction fee for online bookings? No. The ticket charges are inclusive of any transaction or booking fee. Q.3. Is there private car parking available? Get parking facility at flat $10 when you make an advance online booking with Wilson Parking. 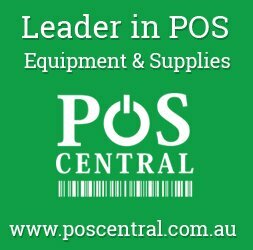 For details, please Click here & select the ‘Book a Bay’ option. Q.4. Is there food available at the venue? No. Catering service is not available for the Farhan Live show. Q.5. What time does the Farhan Live show start? Doors open at 6.30pm for a 7.00pm start. It is advisable to arrive early so as to avoid rush. Q.6. Do I need to get separate tickets for children? You need a ticket for children over 5 years of age. Children under 5 years don’t require tickets but no separate seats will be allocated to them.